Generating objects 25 to 100 times faster than traditional layer-based 3D printers, this new continuous-liquid approach to high-speed fabrication can create complex yet refined finished objects that are at once more pristine and quickly produced, all by harnessing oxygen and light to ‘grow’ results. Its inventors say their solution was inspired in part by a well-known, time-traveling, liquid-metal robot from a science fiction film and indeed both technologies may be poised to change the the future. A group of scientists from the University of North Carolina have just published a paper in Science on the technology, filed for a patent and formed a company around it called Carbon3D, currently backed by $40,000,000 in funding. 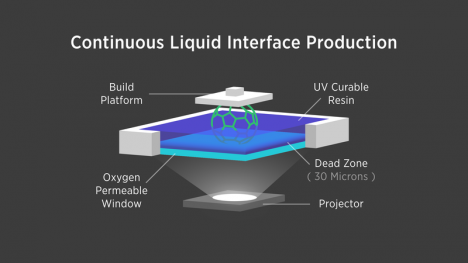 Essentially, a pool of photosensitive resin floating on a plane of dissolved oxygen provides the raw material bath, while a device suspended above draws resin up and out. The trick to hardening the substance as it is lifted lies in a UV light projector which emits a 2D cross-section of each layer, continuously changing shape as the device above is raised. Watching it in action, it is easy to see how the idea came in part from the shape-shifting Terminator ‘upgrade’ first found in the second installation of the ongoing movie franchise. Emerging from a liquid pool, the resulting solid takes shape with remarkable speed. Meanwhile, materials like “elastomers cover a range of needs, from the high elasticity needed for athletic shoes to the strength and temperature resistance needed for automotive parts.” Currently, the device on display is just a prototype, but once put into commercial production it could well be a pivotal piece in transitioning the 3D printing industry from a slow-growing niche to a full-fledged revolution for making everything from rapid prototypes to other useful objects at speed.